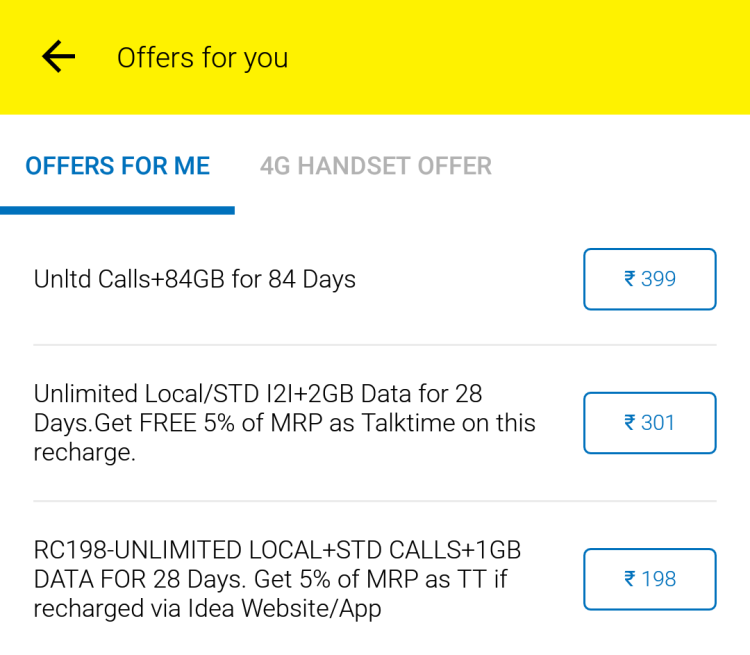 Idea Cellular has launched Idea 399 Plan for its existing customers offering Unlimited Data & Calls for 84 days. Even tough the Idea 399 Plan is not listed anywhere but it is available as Special Offer which can be availed by dialing *121# or installing MyIdea App to know more. Apart from Idea 399 Plan, Idea is also offering Idea 404 Plan & Idea 505 Plan to its customers offering exactly the similar benefits. We have detailed the information below for both Idea 404 Plan & Idea 505 Plan. Idea has started offering Idea 404 Plan for some its customers which offers Unlimited Local & STD Calls for 84 days with 1GB data daily. Idea 404 Plan is a special offer just like Idea 399 Plan, you need to dial *121# to know if it is available on your number. Also you can install MyIdea App where you will find the Idea 404 Plan under your Special Offer as shown below. Also Idea 505 Plan is being offered to some customers offering 1.25 GB data daily with Unlimited Local & STD Calls with 84 days validity. Idea 505 Plan too is a special customised offer for existing Idea customers. To know if you are eligible for Idea 505 Plan, you have to dial *121# or install MyIdea App as already discussed above. All Terms & Conditions for Idea 404 Plan & Idea 505 Plan are exactly the same as Idea 399 Plan as mentioned on this page. If Idea 404 Plan & Idea 505 are not available on your number as Special Offer, we recommend not recharging as you will get only Unlimited Local & STD Calls with 1GB data for 14 days & 21 days respectively which are available as regular STV to all Idea customers. For existing Idea Customers, you need to install MyIdea App to avail the offers. Also you can dial *121# to check whether the same can be recharged with existing balance. 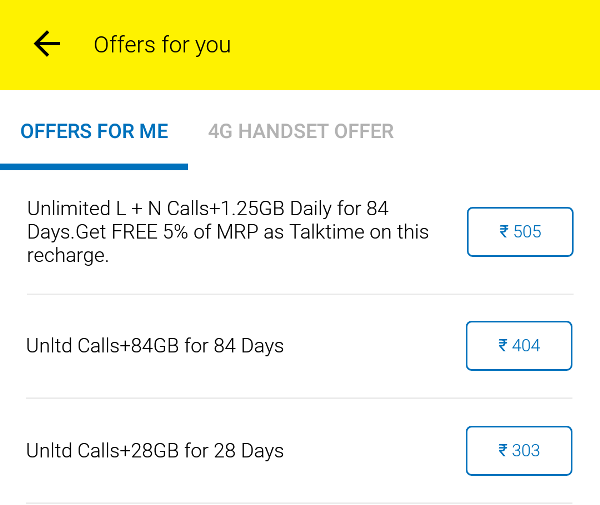 Idea 399 Plan is not available for New Idea Customers but Idea 395 Plan offers similar benefits to new customers joining Idea as it is available as First Recharge Coupon (FRC). You can read more here if you are a planning to join Idea. Also Airtel, Vodafone & Jio has launched some exciting offers for new customers joining their network, we have listed some plans below. Under Idea 399 Plan, Outgoing Calls during Roaming would be charged at Standard Roaming Tariff and only Incoming Calls would be Free. Idea 399 Plan – Alternatives? 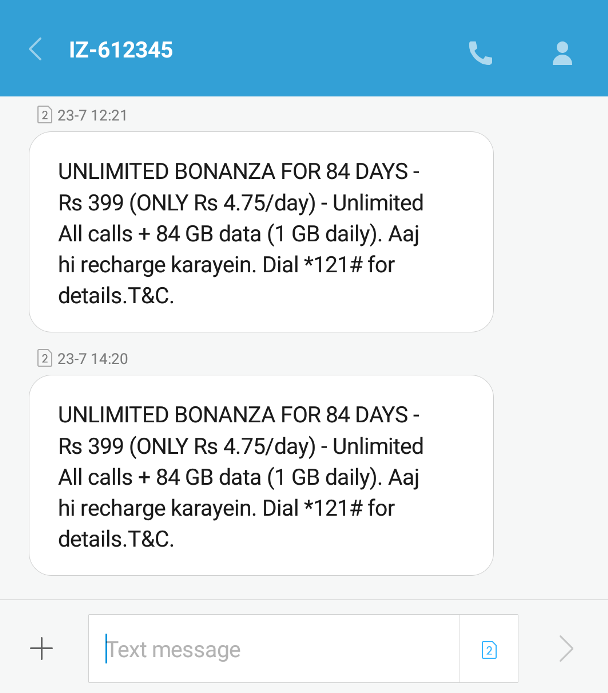 Airtel 449 Plan – Airtel too is offering similar Plan where Airtel to Airtel calls would be Free for 70 days and 1 GB data would be offered for 70 days.